1. 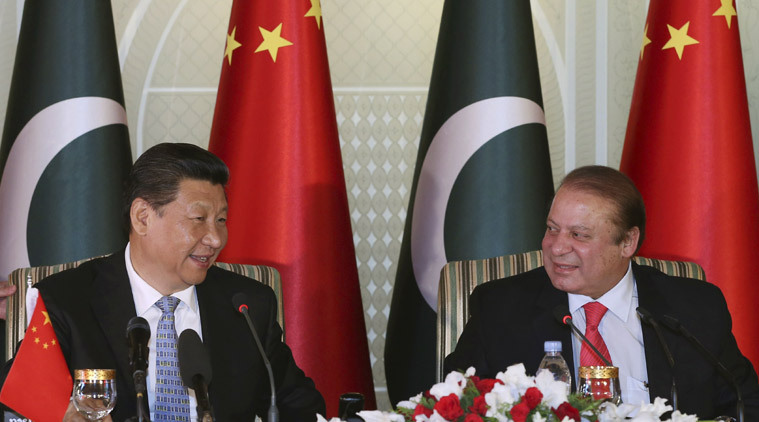 Economic and technical cooperation agreement between China and Pakistan. 2. Exchange of notes of feasibility study of the demonstration project of the DTMB. 3. Exchange of notes on provision of anti-narcotics equipment. 4. Exchange of notes on provision of law enforcement equipment. up-gradation of the Karakorum Highway (Havelian to Thakot). 10. Protocol on banking services to agreement on trade in services. 11. MoU on provision of material for tackling climate change. Development and Reform of Pakistan. 14. MoU on Pro Bono Projects in the Port of Gwadar Region. 15. MoU on establishment of China-Pakistan joint cotton bio-tech laboratory. and establishment of Havelain dry port of Pakistan Railways. 17. Protocol on the establishment of China-Pakistan joint marine research center. Sichuan Province of PRC and Lahore city. Guangdong province and Gwadar city. 24. Commercial contract on Lahore Orange Line Metro Train Project. 25. Agreement on financing for Lahore Orange line Metro Train project. Gwadar east bay expressway, Gwadar international airport projects. of China Limited and SK Hydro (Private) Limited. (Private) Limited as borrower and China Development Bank Corporation as lender. Pakistan Economic Corridor between China Development Corporation and HBL. 35. MoU with respect to cooperation between Wapda and CTG. PCC of China and HDPPL. development in Pakistan between ICBC and HBL on financial services corporation. 39. The financing term sheet agreement for Thar Block –I between ICBC, SSRL. Electric Group for Thar Coalfield Block I Coal-Power integrated Project in Pakistan. Distribution Company (NTDC) and National Grid of China. 44. IA on Port Qasim Coal fired Power Plant between Power China and GoP. limited and Shandong Ruyi Group. 1. Industrial and Commercial Bank of China, Lahore Branch. 3. FM 98 Dosti Channel studio PBC-CRI, Islamabad. 4. Demonstration project of DTMB Broadcasting in Pakistan. 5. China Cultural center Pakistan. -Pakistan Joint Research Center for small hydropower, Islamabad. -pakistan cross-border optical fiber cable system project. 8. Metro rail transit system on the Orange Line in Lahore. 1- Karot 720 MW Hydropower project. 3- Sachal 50 MW Wind-power project. 4- Zonergy 900 MW solar project. 5- Jhimpir 100 MW Wind-power project.